The 2016 SEMA Auto Show is opening its gates on the 1st of November and a lot of carmakers are already preparing hot rides for official debut. Along the newest prototypes announced at the show, carmakers are also teaming up different aftermarket specialists to build up special models with significant upgrades in terms of styling and performance under the hood. It is also the case of South Korean carmaker Hyundai which has released a special Veloster Concept in a partnership with Gurnade tuner, the model heading as well to the auto event. There are a lot of attributes that characterize the track-focused Veloster like agility, lightweight characteristics and an extremely aggressive design. Speaking about aggressive attitude, Joshua Cloud, CEO at Gurnade Inc, has also declared that the tuning company “has always been drawn to the uniquely aggressive lines of the production Veloster”. 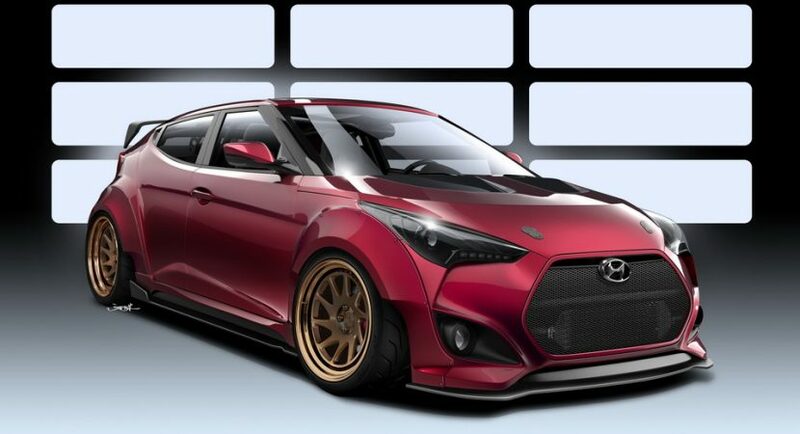 “So when Hyundai approached us with the opportunity to develop one of their vehicles for SEMA, we didn’t hesitate to create the Gurnade Veloster Concept. It leverages all the strengths of the Veloster and takes it where we always envisioned it could go,” Cloud also added. From a visual standpoint, the Gurnade Hyundai Veloster Concept, comes with a lot of one-off styling bits, starting with the Magic Magenta paint and carrying on with Lightner Motorsports fender flares and grille, side sills and custom rear garnish, EPR carbon-fiber front spoiler, carbon-fiber hood and hatch, carbon fiber ARK Performance spoiler, bespoke headlights and fog lights. The powertrain details are not known at the moment, but it is definitely going to be impressive, given the plethora of mechanics added to the model. We are looking here at the 845 Motorsports intercooler, cold-air intake, ECU remapping, new downpipe, Synapse blow-off valve, ARK Performance cat-back exhaust, NEO Motorsports coil-overs, six-piston braking kit, Pierce Motorsports strut bar, rear torsion bar and much more.